We've long been annoyed by inconsiderate drivers. Now, it's time to become more considerate bicyclers. March 12, 2009, 2:19 a.m. So you've heard -- bicycling's really getting popular in urban areas. In Los Angeles, we just had a day-long LA Bike Summit that drew speakers from all over -- and a huge number of attendees from all parts of the metropolis. And in New York city, lots of new bike-friendly urban planning's getting more two wheelers on the road. In fact, Manhattan's gotten so much kinder to cyclists that long-time cyclist Robert Sullivan wrote a long piece in the New York Times called "A Modest Proposal," practically gushing about the eco-transit-friendly policies -- and urging fellow cyclists to shape up! For a very long time -- and even now, cyclists have fumed at automobile drivers for failing to share the road. After all, in cities where roads are primarily built for cars, drivers often aren't quite sure how to coexist with bicyclers -- and many drivers have an even harder time giving up their sense of entitlement to the road to allow bicyclers equal access. That sort of anti-bike mentality's long irked bicycle enthusiasts -- but Robert points out that bicyclists can be similarly inconsiderate on the road. Now, as much as we would perhaps prefer not to, we must stop to look at ourselves and realize that we have a little giving to do. I am talking about perceptions, about the things we should do outside the letter of the law, like the way we try not to killthe person in front of us in the revolving doors. Robert's four proposals are so simple that one wonders why cyclists aren't already doing these things. What Robert proposes: Stay off the sidewalks and ride in the direction of traffic, signaling and stopping at lights. (via kottke) Of course, when bike infrastructure's not all there, it can be tempting to bike on the sidewalk, which at first glance seems safer than the road. And in a city where everyone jaywalks, braking at every stoplight can seem like a hassle. 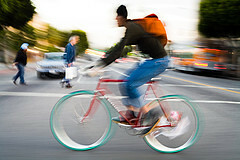 But these simple practices would really help cyclists get along with both pedestrians and car drivers, Robert opines. If you've ever taken a bicycle safety class, Robert's suggestions are probably already second nature to you -- which is why I'd love to see a better bike safety curriculum incorporated into our schools. After all, my high school had a drivers' ed class. Why not have the same for bicycles? So you've heard -- bicycling's really getting popular in urban areas. In Los Angeles, we just had a day-long LA Bike Summit that drew speakers from all over.